One of the most common types of tennis injuries is also one of the most famous. Your elbow is obviously a key part of your tennis swing, and if you are over-zealous in swinging rackets, you’re going to eventually strain your elbow. This injury is also known as “lateral humeral epicondylitis” and it’s characterized by painful inflammation on the outside portion of your elbow. Specifically, it affects forearms muscles and tendons. What happens, essentially, is that you work your forearm muscles a bit too hard, often because you don’t quite have your backhand down properly in addition to other causes. Unfortunately, it’s often not possible to heal tennis elbow instantly. However, one thing that you can do is reduce the healing time by a significant amount through some self-treatment methods. The first step is to figure out how far along the injury is. Pain in your elbow from playing tennis is often separated into two separate stages. The first is called “acute” tennis elbow and this is when you’ve only had the condition for a few weeks, no more than three at the most. Your elbow will be a bit inflamed and swollen at this stage. The solution to this is simple, just put ice on it. If you can get the swelling down, you can help to heal your elbow much faster. On the other hand, if your elbow has been troubling you for a period longer than a few weeks, and you don’t have any obvious swelling in your elbow, then you should use heat instead. The majority of people who get tennis elbow actually don’t play tennis, since it’s a common ailment. All it takes is doing the same thing over and over again with your arm. You have to figure out what it is you were doing that caused damage to your elbow so you can correct the issue. Many other sports can cause tennis elbow as well if you are performing a similar task over and over again with your dominant arm. The important thing with avoiding tennis elbow is to focus on proper technique when you’re doing your backhand stroke. If you’re moving your wrist too much during a backhand stroke, it can cause damage in your elbow. If you position your elbow so that it’s leading ahead of your swing, this is also a problem. You need to select a tennis racket that fits your size as well. If you have a racket that is too large, this could put pressure on your elbow. It may also help to switch to a two-handed backhand since this will relieve the pressure on your elbow. Once your affliction is healed, it’s important to make sure that you don’t end up with the same problem again, so you need to carefully examine what caused it in the first place. Sometimes, the issue isn’t the size of the racket, but how heavy it is and how much pressure you’re exerting when you hit the ball. In this case, rackets that are larger but still light are ideal. In particular, rackets made of graphite at the head with tighter strings can make the “sweet spot” area wider, which makes it easier to distribute the force from the hit. 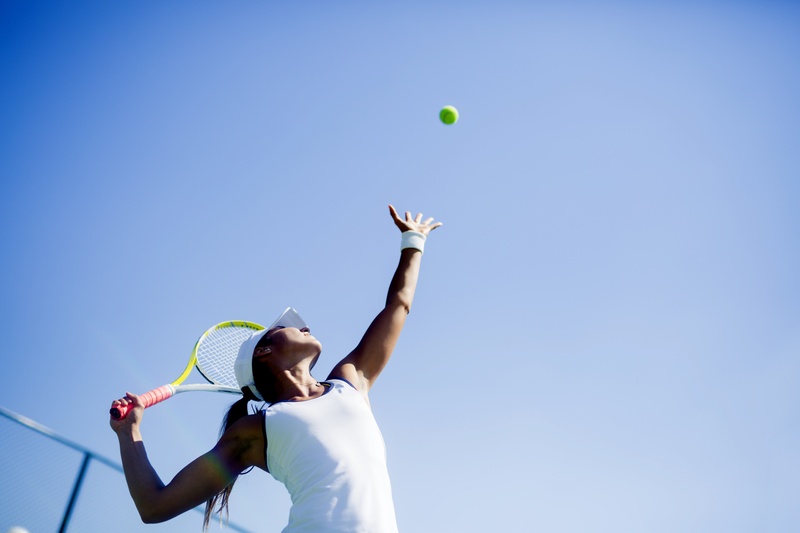 Overall, you can often treat your tennis injuries yourself, provided you have the knowledge and wherewithal. Obviously, at some point when things get bad enough, you’re going to want to seek out a doctor. But, a little wisdom combined with a healthy dose of cold packs and heat packs, depending on the situation, can certainly go a long way. You can also do tennis elbow stretches to help as well. This is when you hold out your arm, palm down. Next, you’ll bend your wrist down and then grab your fingers with your other arm and pull them up toward you gently. This will stretch the area along your forearm towards your elbow. Hold it for 10 seconds, and do it two or three times per day, and you’ll ensure that your elbow stays in good working order. Wrist problems often happen because of rotating your palm upward too much, often in order to try to get topspin. Cold and hot packs can help for this injury as well. You should be especially careful when it comes to your Achilles' tendon because if you go too hard, you could tear it such that you need surgery. If inflammation occurs in the Achilles' tendon, you need to pull back on how much you run on it, as well as take anti-inflammation medicine. It also helps to put a heel lift device into normal tennis shoes. Stretching your calf muscles out while holding your leg straight is also often recommended. If you do this until the inflammation dies down, you should be able to go back to playing slowly, as long as your careful. It’s important to be careful in this sense because when your calf muscle snaps, it’s not always completely obvious that this is what has happened. If you feel any tightness, caution is required. Another common type of injury in tennis is when you injure your shoulder, such as what’s called “rotator cuff tendinitis.” What we call the rotator cuff is made up of tendons and muscles coming from the shoulder blade. They all work together to move your upper arm. If you use the tendons too harshly, you can get inflammation in these tendons. If you damage the rotator cuff tendons specifically, then it’s a rotator cuff injuries. One of the most common ways to get this is when you’re first starting off playing tennis and you do a lot of overhead serves or overhead slams. Alternatively, you could just have a day in which you’re hitting the ball overhead quite a lot more than you normally do. You can work through this issue by taking a break from doing any kind of strenuous overhand gesture, in addition to putting ice on the area. You should also use some anti-inflammatory medication such as ibuprofen. It’s worth focusing on handling this yourself for approximately a week. If the inflammation and pain doesn’t go down at that point, then you should switch over to getting help from a physician. In order to keep from getting the same injury in the future, you need to make sure that you're holding up your racket higher up when you serve. If you’re extending your arm too far out to one side, this is what’s going to screw up your shoulder. The rule of thumb is making sure the degree of your hand to your shoulder is more than 90 degrees. You will also get more power this way when you serve as well. For more information about handling sports-related issues, please don’t hesitate to contact us today.